Had a couple of days to work on the Turing machine during November. It's now on its fourth revision lifter, this time there are two lifting arms, one which will stop at the top of the state box and the second containing the magnets which will continue on, so the magnets are separated from the ball bearings at the top. This seems much more reliable. It needs a longer movement on the string which lifts the arms up, so there's a pulley system to double the effect of the cam lever. 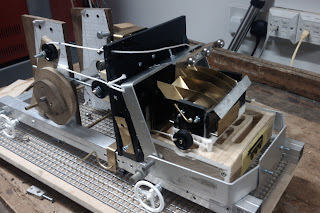 I've also made some changes to the reversing mechanism, using a weight which is just slightly stably balanced so requiring a very small force to switch over to the other direction. This should be operating at the end of another day's work.